Mrs. Mary Terronez; 8-15-18; Announcement CH-4-C Catholic Charities asked me to explain the (essence?) of the emergency services, guidelines, and length of other programs. After receiving my assistence to get emergency aid, these newly arrived residents later developed into trusted, hardworking individuals. Business establishments included Pellner Coal Co., Holy Family Cemetary, Halligan-McCabe Funeral Home, monument places, Hills Department Store and Rock Island Lines Railroad. In my dealings with the Rock Island Railroad, I was a resource person who talked to the superintendent to help people obtain their railroad passes for travelling purposes. Individuals also sought my assistence when they felt they were not being understood or discriminated against in some cases. Consequently I worked approximately 970 hours on volunteer capacity during the period 1930 to 1935. 1935 - During 1935 I was called upon by Former Police Chief Harvey Smith to interpret for Davenport Police Department when a case involved a non-English speaking individual. I was also asked to contact the family of the individual since most individual's could not afford a phone, or the police could not communicate with the family. 1940- Called upon by Sheriff's Department to interpret many times. 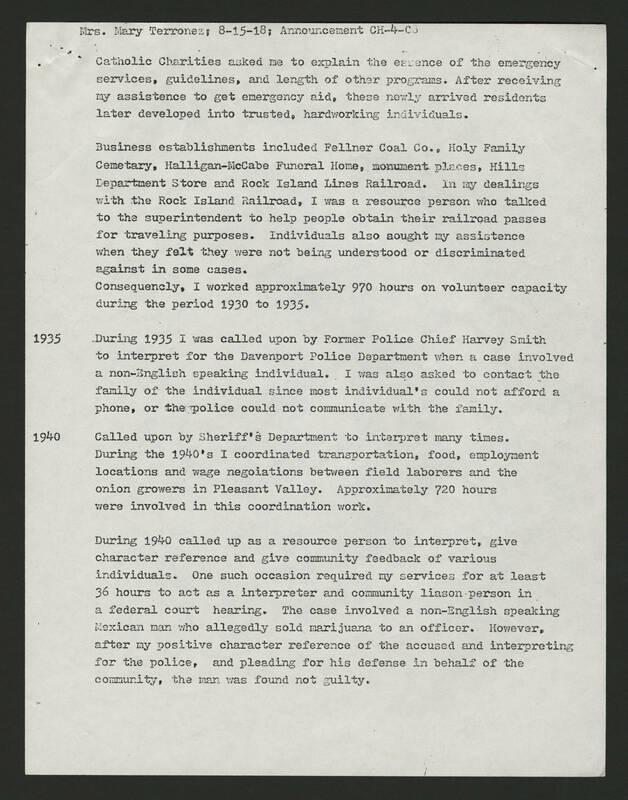 During the 1940's I coordinated transportation, food, employment locations and wage negoiations between field laborers and the onion growers in Pleasant Valley. Approximately 720 hours were involved in this coordination work. During 1940 called up as a resource person to interpret, give character reference and give community feedback of various individuals. One such occasion required services for at least 36 hours to act as a interpreter and community liason person in a federal court hearing. The case involved a non-English speaking Mexican man who allegedly sold marijuana to an officer. However, after my positive character reference of the accused and interpreting for the police, and pleasing his defense in behalf of the community, the man was found not gulty.